This is probably an unnecessary use of genius but I won’t deny the awesomeness of turning a taco into a vehicle for hamburgers and fries. 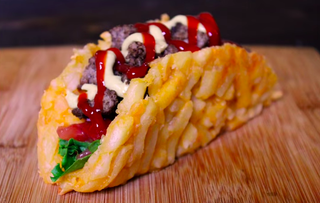 That is, the fries become the taco shell that holds the burger food together. The form of a taco is nearly perfect and the taste of a hamburger is unbeatable (it is true vice versa too), so melding two perfect things together very probably breaks reality. Worth it if it tastes good. For the fry shells the desired shape is a circle. The easiest way to go about this is to lay the nuked cheesy fries out on a flat surface, and let cool slightly.